The Center's 2009-10 season opens in style with a Slee Sinfonietta concert tomorrow evening (Sept. 15) at Lippes Hall. The program spotlights new faculty member Eric Huebner in Ligeti's treacherous but sparkling Piano Concerto, and renowned soloist Elmar Oliveira in J.S. Bach's Violin Concerto in A minor BWV 1041. Writer Philip Huscher has described the piano part to Ligeti's concerto as "fiendishly difficult, though not always in the conventional sense; since the piano often plays quite independently from the orchestra, and sometimes in different rhythmic patterns, coordination becomes critical." Huebner (left) comes well prepared, however: having performed the piece at Zankel Hall at Carnegie Hall in 2006. 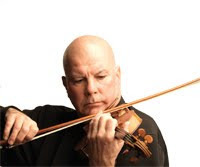 He has drawn worldwide acclaim for his performances of new and traditional music since making his debut with the Los Angeles Philharmonic at age 17. 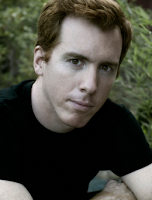 His playing has been described as “full of grace and light” by critic Paul Griffiths and he was recently referred to as “the new superstar” of the 2008 Ojai Festival by critic Alan Rich. Here he is in an excerpt from Messaien's Oiseaux Exotiques, with the Julliard Orchestra under David Robertson. Elmar Oliveira (right) needs no introduction to violin aficionados, having been the only American to date to win the Gold Medal at Moscow's prestigious Tchaikovsky International Competition. His fairly staggering discography includes recordings on the Artek, Angel, Sony Masterworks, Vox, Delos, IMP, Naxos, Ondine and Melodiya labels. No stranger to contemporary repertoire, his best-selling 1997 recording of the Rautavaara Violin Concerto with the Helsinki Philharmonic (Ondine) won a Cannes Classical Award and has appeared on Gramophone’s “Editor’s Choice” and other best recordings lists around the world. With a nod to the upcoming High Holidays, tomorrow evening's program also includes Ernst Bloch's 1923 score Baal Shem. Subtitled "Three Pictures of Hassidic Life," the piece comprises three movements: Vidui (Contrition), Nigun (Improvisation), and Torah (Rejoicing). Ticket information is available here.